Programmed by Andrew Braybrook, developing for Graftgold, and published by Ocean Software in 1990. Only contains the first seven islands, does not contain the final three hidden islands. Reportedly, the original European release lacks a simultaneous two player mode, while the American release has it added in. 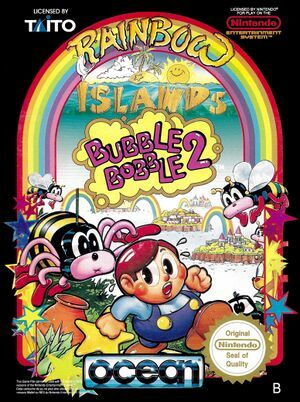 Beyond the omission of the final three islands and two player mode, extremely faithful to the original arcade version. Re-released by The Hit Squad in 1992. Programmed by David O'Connor, developing for Graftgold, and published in Europe by Ocean Software in 1989. Only contains the first seven islands, does not contain the final three hidden islands. Beyond this omission, remarkably faithful to the original arcade version, despite the limited available screen resolution. Programmed by Andrew Braybrook, developing for Graftgold, and published by Ocean Software in 1990. Almost canceled due to a disagreement over the copyright with Taito that was eventually resolved. Only contains the first seven islands, does not contain the final three hidden islands. Beyond this omission, extremely faithful to the original arcade version. Programmed by Gary Foreman, developing for Graftgold, and published by Ocean Software in 1989. Only contains the first seven islands, does not contain the final three hidden islands. Beyond this omission, fairly faithful to the original arcade version due to simplifications in screen resolution and color pallette limitations. Re-released by The Hit Squad in 1992. Developed by Taito, and published only in Europe by TDK Core in 2001. Something of a compromise between the original arcade version, and the official Taito conversion for the Famicom, this version contains a few changes. For one, it contains eleven islands, making it the conversion with the most islands. 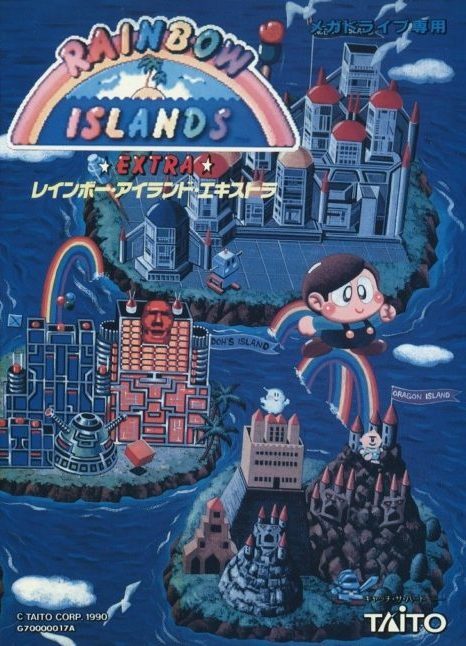 It uses the same original ten islands as the arcade, but it includes the addition of the KiKi KaiKai themed island, introduced in the Famicom conversion, as one of the hidden islands. 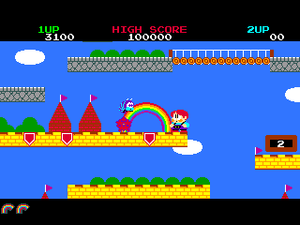 Additionally, the islands are selectable, allowing the player to defeat them in any particular order, although Dragon Island does not appear until the first six islands are completed. It uses the original Bubble Bobble music. It also lacks the permanent power-up items, and you are granted entry to a secret room whether you collect the small diamonds in the correct order or not. 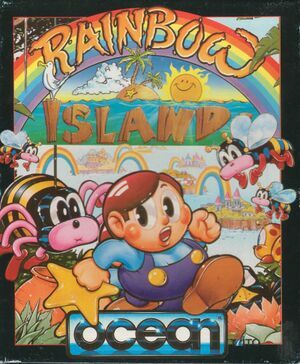 Originally developed and published in Japan by Taito for the Famicom in 1988. It was released much later in the North American market by June 1991 with modified background music. 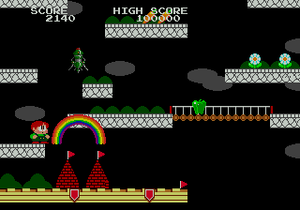 Alters the game in a number of ways, although the basic game mechanics remains faithful to the original arcade version. There are only eight islands. The only hidden island is the final island. 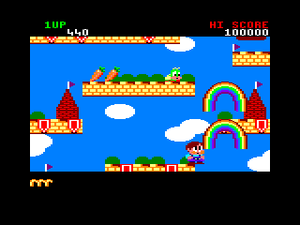 Some islands are removed or combined, while a new island with a KiKi KaiKai theme is introduced. The number of power-ups and items are reduced. See the Taito NES\SMS Guide page for more information. 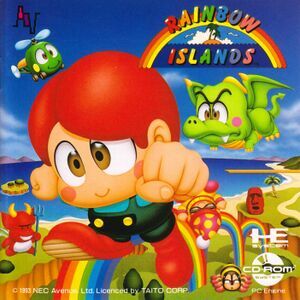 Developed and published in 1992, completely independently by Ocean Software, this version is considerably different than Taito's own conversion of the game. 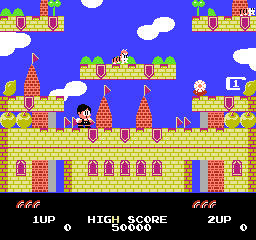 The graphics are much more faithful to the original arcade version. 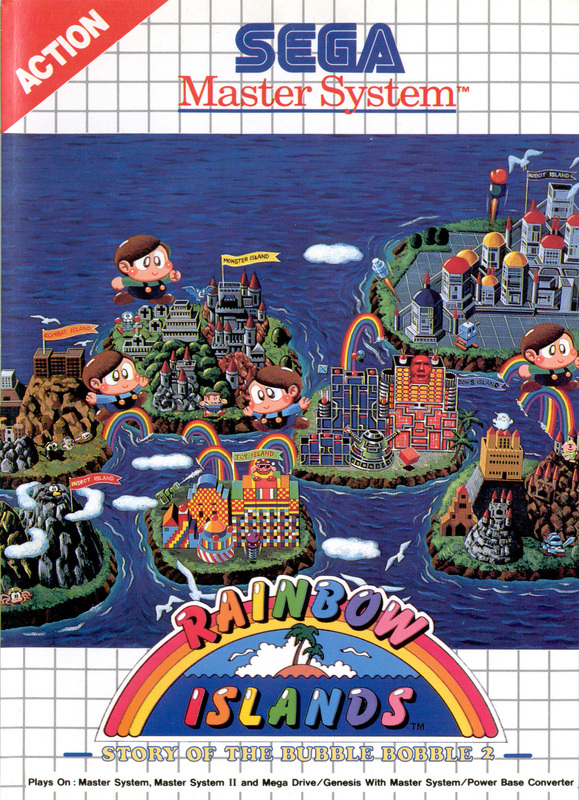 Like all of Ocean's other conversions of Rainbow Islands, this conversion only contains seven islands and lacks the three hidden islands. Additionally, collecting the small diamonds is much harder in this version. Instead of landing anywhere within a column of the screen, enemies must land on specific smaller columns the size of a single platform block in order to generate a small diamond. Otherwise, a normal item is produced, even if the enemy was crushed by a rainbow, or hit by stars. These columns are not contiguous. Developed by Bits Laboratory and published in Japan by NEC in 1993. It was released in CD-ROM format. One of the most accurate conversions of the original arcade game made. The only thing omitted is the ability for two players to play simultaneously. It also provides players with the ability to go back and visit islands that have already been completed. Reportedly released four years after it was announced. Despite being incredibly accurate, comes with no frills for being a CD-ROM release; no remixed music, no extra stages, etc. Developed by ITL and published in Europe by Sega in 1993. This version is based entirely on Taito's Famicom/NES conversion, and thus contains all of the same alterations from the arcade game. 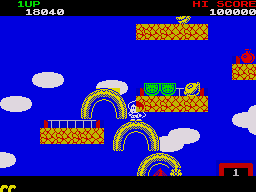 However, due to the Sega Master System's improved color capabilities, many of the colors are more accurate to the arcade than the Famicom version. 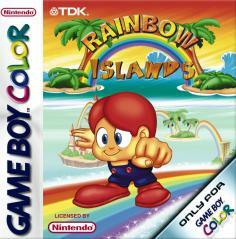 The original European release contains a bug that prevents players from reaching the eighth and final island. However, this bug was corrected in the Brazilian version of the game. See the Taito NES\SMS Guide page for more information. 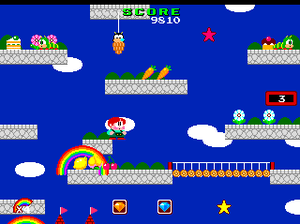 Developed by Aisystem Tokyo and published only in Japan by Taito in 1990. 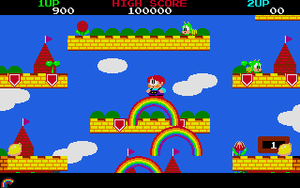 This version is considered one of the definitive conversions of the game, containing both the original arcade mode as well as the Extra version (which is the default mode of play). See the main page for more information about how the Extra mode differs from the original. Developed by Graftgold and published in Europe by Ocean Software in 1989. Only contains the first seven islands, does not contain the final three hidden islands. Beyond this omission, fairly faithful to the original arcade version, despite the limited available screen resolution and the fact that the system was only capable of single color sprites. Re-released by The Hit Squad in 1992. This page was last edited on 14 December 2013, at 06:56.